Northcote City FC was formed in 1960 by a group of Greek migrants new to Australia with a passion for sport and a need to form friendships in a new country, with soccer being the major connection. In its formative years the club fielded teams not only in soccer but also in Volleyball, Basketball and Table Tennis. The Club’s honours list includes the Victorian Premier League Grand Final, the Dockerty Cup and Hellenic Cup. Originally known as Hercules, the Club soon adopted the name Princes Park Hercules. The 1977 change of home grounds to Fairfield Park led to the short-lived use of the name Collingwood City. In 1980, the Club secured its move to John Cain Memorial Park, reforming itself into Northcote City Soccer Club. With John Cain Memorial Park being used extensively for Lawn Bowls competitions, international cycling events in the new velodrome and the State Football Centre used for training and matches. In 2011, Northcote finished sixth in the league, missing the finals by one point. That did not stop the Seniors from adding important silverware to the cabinet, as the team lifted the Mirabella Cup, defeating Melbourne Knights 2-0 at AAMI Park. 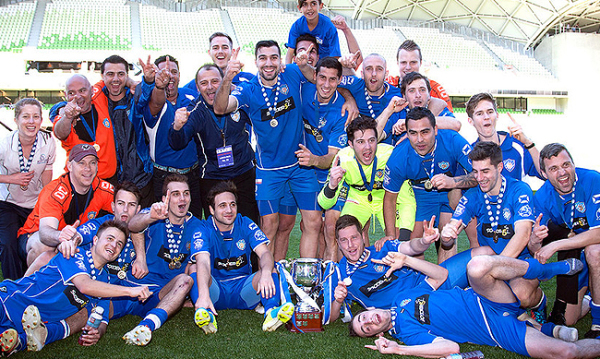 2013 marks the high watermark of Club success, as Northcote City won its first Victorian Premier League Championship, defeating Bentleigh Greens 3-2 after extra time at AAMI Park. The Club also won the Victorian State Championship at Under 21 and Under 18 levels. The progression of Northcote City in recent years has met with interest from A-League clubs in our players, with Jason Trifiro, Glen Trifiro, Rashid Mahazi and Paulo Retre all having played for the Senior Team before moving to their respective clubs. Several of the Club’s young players have also spent time training with the Melbourne Victory and Melbourne City youth teams. At junior level, the transformation of the club saw a modest number of 90 players grow to 450 across all age groups in 2013. The addition of Girl’s Teams and a 7-A-Side Disability Team has enriched the Club’s membership base and helped us achieve a deeper connection to the local community. The future of the Club is mapped by a strong board commitment to the promotion of young players into the Senior Team, with the pathway being managed by our Football Department. In 2014, the Club accepted a position in the new National Premier League, where it will look to defend its State crown. After three years retaining a spot in the Victorian top tier, Northcote would finish second last, resulting in the club being relegated to NPL2 in 2017. Just after the completion of the 2016 season, Lozanovski stepped down from his position. In preparation of its first season outside of the top-flight since 2009, Northcote announced Zeljko Kuzman as its new manager for the 2017 season. 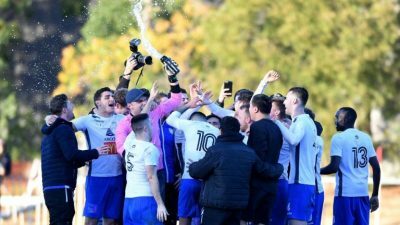 City achieved promotion back to the NPL after just one season out with one round to play with a 1-0 win over Moreland City FC. At a junior level, our U18 boys were able to dominate the league, finishing first, and 13 points clear of second. Our U13 Boys would also finish runners up. After the 2017 season, Kuzman departed the club to take up a role with Dandenong City SC. Northcote reacted by signing former Port Melbourne SC coach Eric Vassiliadis. The club looks to build a successful future, in both the seniors and junior teams. The Club first gained promotion into the Victorian Soccer Federation leagues in 1964 after competing in the amateur competitions in its formative years. In 1965, the Club achieved its first ever championship, winning the Metropolitan League Division 4, suffering only one loss for the year. In a golden era for the Club, consistent finishes in the upper reaches of the ladder, saw a second championship arrive with the Metropolitan League Division 3 title won in 1969. The early to mid 70’s saw the Club struggling to make an impression on Metropolitan League Division 2 until a wonderful 1977 campaign led to a second-place finish behind Doveton and promotion to Metropolitan League Division 1 for the first time. A top 4 finish in 1980 saw the Club achieve win promotion to the Victorian State League, which would later become the Victorian Premier League. The 1980s were not kind to the club and many bottom-half finishes ultimately saw the club relegated in 1991 back to the State League Division 1 competition. The 1990s were not much kinder when a Victorian Soccer Federation restructure in 1999 saw the club relegated to State League Division 2 despite finishing 5 places form the bottom of the ladder. If the 1980 and 90’s were not kind to the club, then the first decade of the new millennium is arguably the greatest in the club’s rich history. An undefeated Championship success in 2002 in State League 2 North West saw it regain its standing in State League Division 1, a feat that lasted only until 2006. In 2008, the Club won State League Division 2 S/E, earning promotion to State League 1. A year later, the Seniors finished first in Men’s State League 1, earning promotion to the Victorian Premier League under Head Coach Peter Tsolakis.